You are looking at the metal parts that are needed to make a 3hp model M engine cart. These are unused reproduction parts that have been stored several years since they were cast by Cattail Foundry. They must picked up at my house. The item "IH MODEL M Gas Engine Cart Parts 3hp" is in sale since Saturday, October 15, 2016. This item is in the category "Business & Industrial\Heavy Equipment Parts & Accs\Manuals & Books". 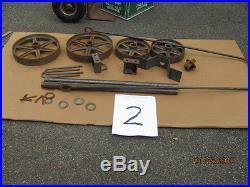 The seller is "ah72541" and is located in Carver, Massachusetts. This item can't be shipped, the buyer must pick up the item.